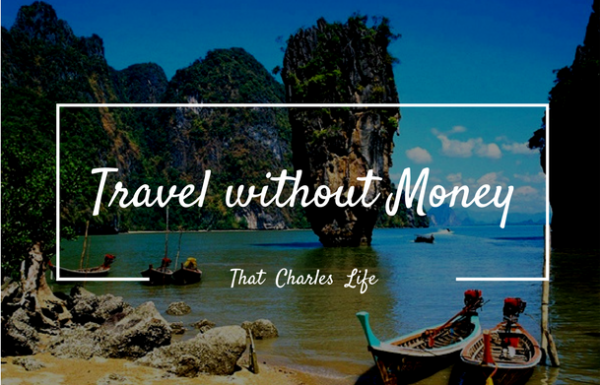 Travel Without Money: Do You Need Money To Travel? That statement above seems to be the voice of this current generation called millennials. I think travel has always been in style, it’s just more accessible than it’s ever been and with social media and the internet, you can literally talk to your friends and family daily yet be on the other side of the world. Years ago when I first joined Instagram I always wondered HOW do these people travel non stop? I figured they must just have ultra wealthy parents. Now I’m a bit wiser to how it’s possible to make a life of terminal travel, if you really want it. Even for normal people. But the debate remains, people seem to think you can only be well traveled coming from a silver spoon advantaged background. I recently watched a CollegeHumor video mocking a girl whose ability to travel resulted from her father professedly invented YouTube. While the antagonists in the clip were debt riddled university graduates from modest means. So I thought I would explore whether or not family net worth is the only prerequisite to becoming well traveled. I then plan to discuss some factors that can make or break a life of travel, and finish off with some options for increasing the stamps on your passport. Can you travel without money? If you have internet access or a mobile phone plan to read this, you can travel. Coming from a first world country, I like to think that anyone can travel. On a grand scale, some people just win the lottery from where they are born. Some nationalities have a harder time getting into countries with visa issues and the such. Also, there’s a chunk of the global population who live on like a dollar a day if not less. Unfortunately, those people probably won’t be backpacking Europe or exploring South East Asia for 6 months. Those aren’t the people I am writing about, and they probably aren’t reading this. For anyone who’s reading this because they have a smartphone with data or internet access at their residence. Do you need to be rich to travel? That’s the simple answer. Coming from a family who paid your way and will provide a golden nest egg for you in your later years is not a prerequisite to traveling the world. Don’t get me wrong, there are many people – instagram stars – who come from generous background. That’s just a fact of life. Based on the percentage of wealthy people in the world, there’s got to be more people from economically average households traveling than rich folk. So again, it’s not a prerequisite. Get the idea out of your head that without a million dollars you cannot travel. Before I transition into the next part of this article where I will talk about certain situations that reduce your ability to travel I would like to introduce you to an interesting money blog I came across a while back. You can afford anything, but not everything. Absolute marketing gold. But besides that, it rings so true. You absolutely can travel for the rest of your life without Donald Trump as a father-in-law. But you’re gonna’ have to make some sacrifices. Young or old, you can travel without millions. But like I said above, there will be sacrifices. Though sacrifices seem like the wrong word to use. I prefer trade off. Sacrifices suggests that without these things you are trading for travel you might some how be getting ripped off. That’s far from the case. I’ve talked in the past about skipping some of these aspects of life for freedom, travel and to keep options open. I’ve said it before and I’ll state it again. There is no wrong way to live your life. If you decide to chase what I’m going to suggest avoiding, don’t think I’m looking down on you or think ill of you. I’m just stating facts, in a lot of cases for average people you can’t have all of these things AND travel, or the freedom to do so. Homeownership. This blog was partly built on the topic of homeownership and the therein lack of. Owning your own home is the dream of many in the western world, and recently one of the main investment vehicles for many people. In most cases though, jumping into a mortgage is the #1 way to lock yourself down and rule serious travel out of the question. 1-2 weeks in Mexico or a weekend in Vegas doesn’t count here. I’m talking about a one way ticket to Thailand. Or hiking the Camino De Santiago trail in Europe. And endlessly island hopping in the Philippines. If you checked out Paula’s Afford Anything website, you might find it ironic that I’m stating homeownership makes you location dependent. As she’s a real estate investor who is also a bit of a digital nomad. There’s nothing wrong with owning a home and real estate investing if it’s done correctly and strategically. But for the majority of people rushing to jump into a home for the sake of conforming with the ‘American Dream’.. Think twice about that mortgage if travel is important to you. I think this next part segues in nicely from my last point on homeownership. A location dependant job with 2-4 weeks holidays and rigid office hours is also going to plant a firm barrier in between you and your aspirations to live in the South American jungle for an undetermined amount of time. If you think travel is going to need to be a large aspect of your life, then you’ll want to work towards a job, career, or lifestyle that supports flexibility and movement. Or one that allows you to work and live in these areas that you wish to see. The jobs are out there if you want them, trust me. Real estate investing for example, once you have a network and system in place, you can make phone calls and send emails from anywhere. You need team members or employees and contractors to do the work on the ground. But once you set it up, you can orchestrate from anywhere. Building a website or working online is absolutely still possible with a low barrier to entry. Teaching ESL allows you to make serious cash and live in many places in the world including South America, Europe, and Asia. Paying off monthly interest minimums on credit card debt because you always need new things and can’t prep lunch at home or require $7 caffeine fixes makes it hard to build up a roundtrip ticket. Debt is a ball and chain, I’ve beat that to death in other posts here over the last year. Lifestyle inflation I’ve spoken less about. It’s the idea that the more money you make, the more you spend. Some seem to think this is the way life works, like the tide comes in and out. On the tropical beach those people will never see. On one hand yes, the reason we work hard is to enjoy the luxuries of life. And you want to eventually get the shiny things that make life worth living. But at the same time, you either need to wait until you can truly afford them, or ask yourself what sounds better; a few months in Argentina, or a BMW and the newest smartphone. One day you might be able to have both, but again for those I’m writing to and about it’s probably an either/or situation. Student debt. Student loans. Ugly, prominent and sometimes the only option. Some people have parents who can afford to send their kids on a year-round-the-world trip & college. Others don’t. Student loans generally have lower interest rates and are among the better forms of debt that’s out there. But it still hurts your dreams of traveling. I’m not advocating skipping university or college. Ironically the job I currently have that’s allowing me to build my investment account AND travel the world, I got because of completing a degree. I am saying consider the payoff for a degree – and huge sum of debt – you are chasing after. And is multiple degrees really going to help you? A medical degree that costs $100,000 but will yield a job that pays that and more in a few years is not a horrible investment. A liberal arts degree that cost $50,000 and will have you struggling to find a $30,000/year job for a decade is a different story. You need to remember universities are FOR PROFIT businesses. I am all for education and bettering yourself, but you must remember to evaluate all the costs and opportunity costs as well. The bottom line is when you are $60,000 in student debt with minimal job prospects, jumping across the world is indeed unfathomable. The traditional path of a 9-5 job in the same city or country for 35 years might not allow for an abundance of nomadism. But there are increasingly becoming new ways that allow you to build a retirement – maybe even early retirement – fund and see all ends of the earth. I would like to introduce you to two current routes I am trying out. Teach English abroad with TEFL jobs. I mentioned briefly above there are many opportunities in most continents by teaching English as a second language. You can easily work half the hours you do at home, save between $20-40,000 a year [!!!] and see much of the world by living in those new cultures. You can even teach english online which is amazing money AND location independent. Talk about winning. This is a bit newer to me, but people have been seriously successful doing this for decades now and there is still much juice to be squeezed. I am currently writing a series that will guide you to start your own website and potentially make money online. Check it out here for free! Lets dispel the rumor right now that you need to be born into wealth and have a trust fund ancestry to travel the world. If you’ve read this article you have it within your power to travel without money. You may need to make some adjustments though, and consider what’s most important to you in this life of yours. I know I had too. But if you want it, it’s completely possible for most average people to turn nomadic. Subscribe to my newsletter to read more about how you too can make travel more prominent in your life. Do you love to travel? Did you have to give anything up to make it happen for yourself? I’d love to hear about it! Comment below. Contact me directly if you’re interested in teaching English. I can help with both abroad and online. As always, ONWARDS & UPWARDS !! Yes, you can travel without much money. There’s one way I don’t see listed: travel hacking. By signing up for credit card bonuses you can earn points and pay a fraction of the price for flights and hotels. Thanks for the comment! Sorry for the very late reply. I have done some research into travel hacking but haven’t actually tried it yet myself. I plan to write about it later this fall when I try it out for myself. Any tips?